September is the month South Africa celebrates the diverse cultural backgrounds of its people in dress, food and general way of life. Heritage day is set to bridge the divide between people who have rather more in common than otherwise and are sometimes unaware of it; a beautiful spectacle to witness. Bright colors greet the eye; questions around identity get answered; feasts on the best exotic delicacies are had… The doek (dhuku), Afrikaans for head wrap, is part of the cultural expression for African women; not only in South Africa but the continent over. 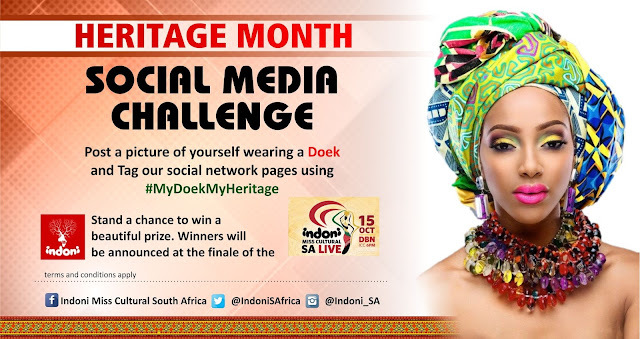 In celebrating heritage month this year Indoni is embarking on an online cultural celebration campaign geared for the entire continent, #MyDoekMyHeritage. The head wrap is different things to different people but a common “crown” on the heads of African women from Cape to Cairo; it is a symbol of self-respect and pride. A trendy one at that for African women, even in the Diaspora. A head-wrap is a common women’s cloth head scarf in many parts of southern and western Africa. In South Africa and Namibia, the Afrikaans word ‘doek’ (meaning ‘cloth’) is used for the traditional head covering used among most rural elderly African women. In other parts of the continent, terms like ‘duku’ (Malawi, Ghana), ‘dhuku’ (Zimbabwe), ‘tukwi’ (Botswana), and ‘gele’ (Nigeria) are used. For the BaTonga women, the opportunity to wear a ‘dhuku’ usually falls on a religious day of Friday, Saturday or Sunday, or other ceremonial functions such as the Lwiindi Gonde, Kuomboka and other initiation rituals. In South Africa, the Doek (Iduku, in Zulu) is culturally worn by married and engaged women, Sangomas have always worn doeks irrespective of gender, as a symbol of their spirituality but recently young women wear it as a fashion accessory to social events. Various political parties have also designed doeks bearing their logos, for women to wear at their rallies and conventions. 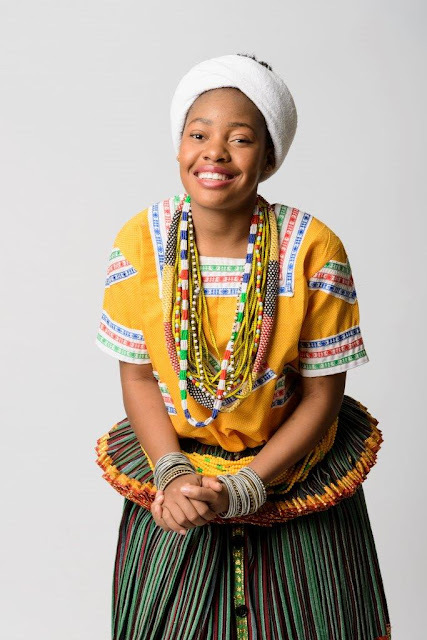 Indoni seeks to preserve culture and restore it as the “old new cool” by introducing the #MyDoekMyHeritage trend as a way to move towards a boundless Africa, and to remind people of the actual reason behind this cultural practice of wearing doeks. We are one people divided yet brought together by the world; aesthetically, socially and otherwise. We need to always remember that we are one people and to better remind ourselves it is important that we find and celebrate our meeting point. In this time where the youth is largely influenced by what they see on social media than what they hear on radio, this campaign is important for meeting young people on their turf so as to remind them within a space that is familiar to them who they are and what makes them the same as the next. #MyDoekMyHeritage a social media trend for all African women in the continent and in the diaspora. Overall best styled doeks stand a chance to win fantastic prizes, Winners will be announced at the Indoni Miss Cultural South Africa Pageant Finale on the 15th of October 2016 at the Durban ICC. It is important for us to remember our roots and document their beauty. Whether it is a heritage that stems from conditions or from love, our heritage is who we are and we must celebrate it, especially in this modern day quest for a united and independent Africa. We have more in common than the world cares to see. Founded by Dr. Y.N. Mthembu, Indoni SA was officially launched in June 2011. The program was formulated as a direct response to various social ills faced by young people on a day to day basis including lack of respect, lack of bankable skills to allow people entrance to sustainable jobs, HIV and AIDS prevalence among young people and the impact thereof on their lives, drug and alcohol abuse, unemployment and teen pregnancies.